Marshmallows are usually light and white and reminiscent of clouds. 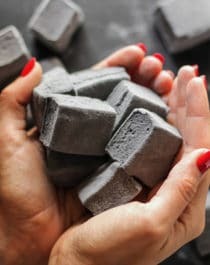 Butthese Healthy Black Velvet Marshmallows? Oh, lemme tell ya. These are just as sweet and fluffy as regular marshmallows, but they’re infused with chocolate and a secret ingredient… can you guess what it is? Despite looking scary and spooky (perfect for Halloween, yes?) these homemade marshmallows aren’t made with any scary ingredients. These are naturally sweetened, naturally colored, and naturally flavored. 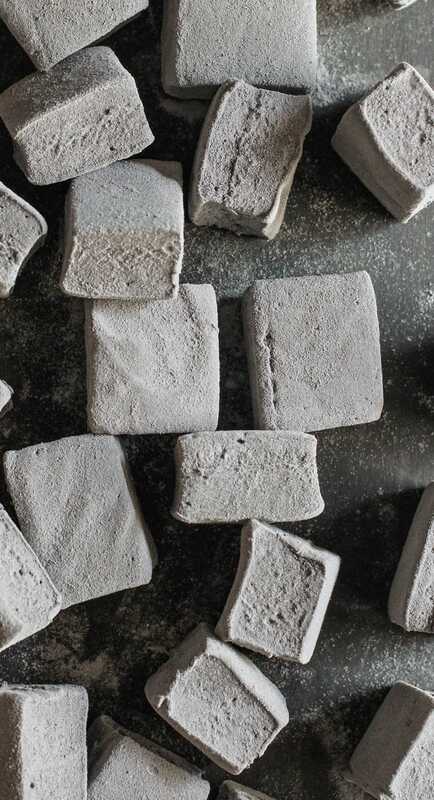 That’s right, these DIY mallows are made without corn syrup and artificial food dye! Storebought marshmallows are made with artificial food dyes, artificial flavors, and refined sugars (and A LOT OF IT). Skip the gunk and make those fluffy bite-sized treats at home! 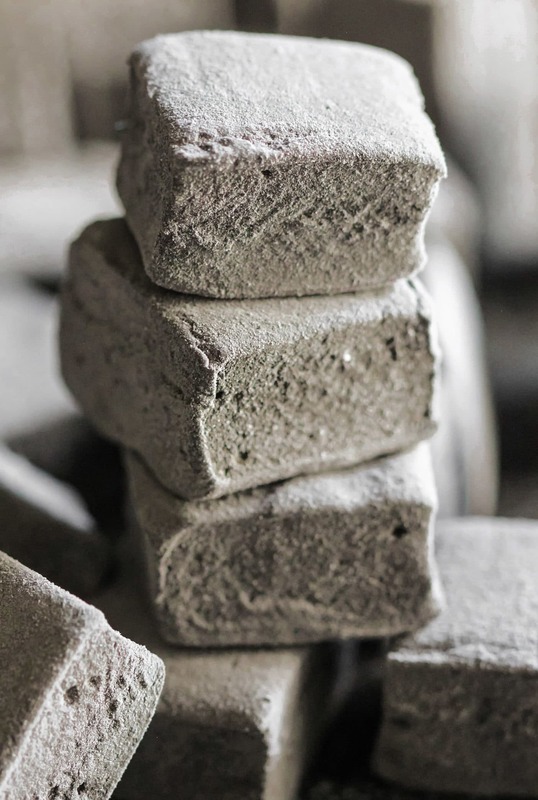 These Healthy Black Velvet Marshmallows are naturally charcoal-colored from the… well, I guess I let it slip… CHARCOAL. 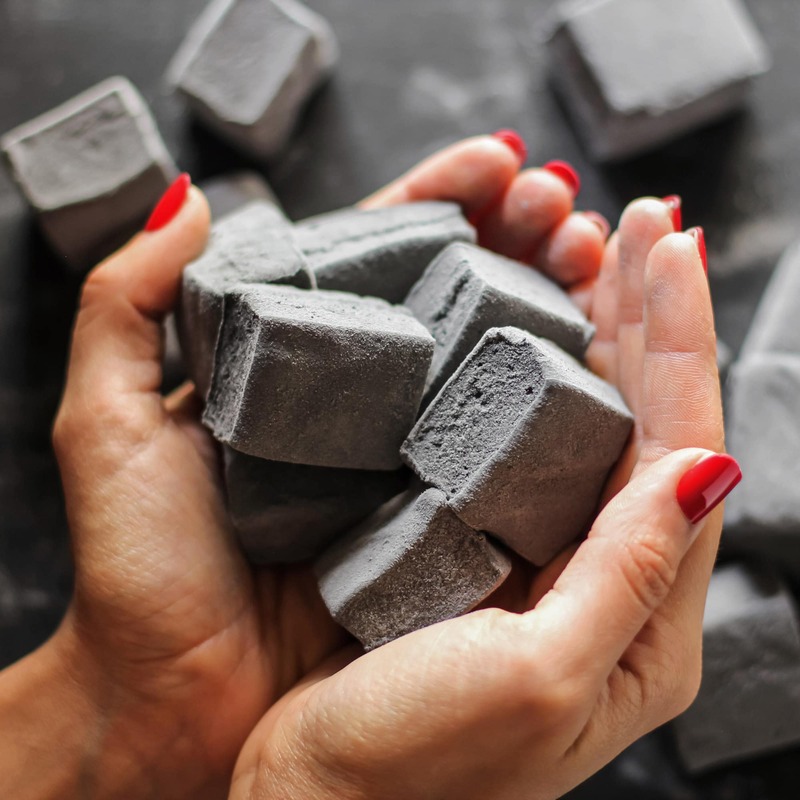 These Healthy Black Velvet Marshmallows are naturally colored with activated charcoal powder, naturally flavored with cocoa powder and vanilla, and naturally sweetened with agave nectar. You can’t go wrong with these light and fluffy, sweet black clouds! These Healthy Black Velvet Marshmallows are just as sweet and fluffy as regular marshmallows, but they're infused with chocolate and a SECRET INGREDIENT! These mallows are naturally sweetened and naturally colored – no corn syrup or artificial food dye whatsoever! Spray two 8x8″ brownie pans with cooking spray and line with parchment paper both ways for easy removal later. In a stand mixer bowl with whisk attachment, add the gelatin and water. Place the agave nectar in a small saucepan (I used a 2-quart pan). Add a candy thermometer to the pan and place over medium heat. Bring to a boil. Remove from the heat when the temperature reaches 230°F. Turn the stand mixer on low speed and slowly and carefully pour in the hot syrup. Cover the stand mixer with a kitchen towel to avoid any splatters on your counter, and increase the mixer speed to high. Beat for 3 minutes. Working quickly, turn off the mixer, add the cocoa powder, charcoal powder, and salt, and turn mixer on medium-low speed. Mix until both powders are combined, then return speed to high. Beat for 5 minutes, or until very thick, shiny, and voluminous. Add the vanilla paste and beat for 1 more minute. Working quickly, scoop the mixture into the prepared pans and spread it out. Let sit for 5+ hours, or overnight. In a bowl, whisk together the starch, erythritol, cocoa powder, and charcoal powder. Dust your countertop with the mixture. Gently flip each marshmallow block onto the counter and coat in the starch. Slice the marshmallows and coat them completely in the starch. Enjoy! To store, place the marshmallows in an airtight container for up to ~1 week. Marshmallows have dominated my thoughts recently. I seriously just want to make ALL. THE. MALLOWS. I have a long list of flavor ideas to try… feel free to vote your favorite so I know which one to make next! Does any flavor seem to be calling your name? Or is there a flavor combo you want me to try? Let me know!